Summary in a sentence: In the vein of Batman Begins, a worthy addition to the series artistically, yet this we are left to wonder about Superman - would he really impregnate and then leave Lois? So let me admit something right off the bat. I loved Superman as a kid. I bought the comic books. 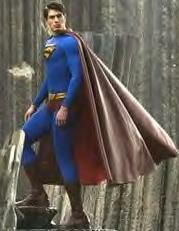 I loved the Christopher Reeve Superman. I loved the George Reeves Superman, and remember being shocked on hearing of his mysterious gunshot death. And when I started hearing the classic orchestra theme at the beginning of the movie, I had a chilling Proust tea-cookie moment. Superman is, like Neo in the Matrix and Paul Atreides of Dune, a substitute Savior. And such an idea, deeply planted in the subconscious of a young child watching this movie, is insidious. Krypton, Superman's home planet, is discovered by astronomers. Superman takes off to find out if there is anything left. Lex Luthor is out of prison because he won his appeal because Superman didn't appear as a witness (he was gone) at the trial. He obtains a fortune and goes to Superman's abandoned Arctic hideout and steals all the crystals there, wherein are contained incredible power. Lois Lane is living with a man who is not her husband, raising a child not fathered by him. In fact, the child is 5 years old, and Superman left a little over 4 years ago....Hmmm....She also was awarded a Pulitzer for an editorial called "Why the World Doesn't Need Superman" - her own "getting over" the Man of Steel in the most public way she could. But like the prototype "new woman" of today - she's the driven career do-it-all mom - who still yearns for the passion of love with one special man. A jarring juxtaposition, but so is this entire movie. Luthor plans to use the crystals to create a new continent that will destroy the United States, and he seals the "seeds" in Kryptonite, thereby ensuring Superman's inability to stop him. Superman saves the day, as always, and in the "are they or aren't they" dance of his and Lois' romance, we find out that the asthmatic kid is not allergic to kryptonite but can sure push a piano - and does, onto a bad guy attacking Lois. The movie ends on the note that the sequel will be another happy chapter in yet another comic-book like installment - thesis, antithesis, synthesis. So why so insidious? The hero, Superman, does stand for truth, justice, the so-called "American Way" and all that. He goes around the planet preventing evildoers from accomplishing their malefactions and averts the results of natural disasters. Superman, if you think about it, is Divine Justice and Mercy as far as humanistic conception can enflesh. He is Justice because he stops evil. He is Mercy because he prevents the bad effects of things that are accidents, like natural disasters. Further, he helps all people without prejudice, just like Our Lord came to save all. If Nietzsche wanted the second part of his "God is Dead" phrase (let the Super-Man reign) to be any more true, he could not ask for it beyond this incarnation of Superman. If God is dead, it doesn't seem like the supernatural virtue of Hope is - and it is instead contortioned into this seemingly beautiful creation - that is really a monstrosity. This...hope in something unreal, as opposed to the very real belief in a very real God. And since Superman can do whatever he wants, impregnating someone you're not married to is obviously okay as well. And that's where Lois comes in. As a co-heroine of sorts, she is held up as a "normal" example. Jimmy Olsen tells Clark not to ask when she's getting married: "She hates that question." Yet, she lives with a man who is not her husband, with a child that she let believe he fathered. And on top of all this, she drops her kid off at day care so she can pursue her career, because, as a modern mom, her kids come second in her life. Lois Lane "has it all." Well, all except the man she loved...or is it loves? And here we see the even more irresponsible notion invade - whatever circumstances may have led her to this point - she is with a "good man" (as she whispers to Superman inches away from kissing him) and yet she is willing to throw that relationship away for her "true love," her "passionate love." And this is the same irresponsible notion that was put forth as the virtue (sic) of Brokeback Mountain - leaving your responsibility - viz. spouse and kids - to follow your "true love." This transitory, Keats-and-Shelley-like notion of "romance" is fed to our children like the IV fluid going into Superman towards the end of the movie - they don't even know it's happening. And frankly, neither do the adults. To be honest, were it not for my Catholic faith, I don't know if I could see behind the lie of what Superman is. He is an alternate for faith. He is a substitute for real heroes, like the Saints. And the solution of Superman is an ignorance of God and His Church. And here the howls come out - does every movie have to be about the Church? No. But I'm not going to wink at movies that try to supplant the Church. If occasionally writing movie reviews has taught me anything, it's that movies have been fed to me as foundational in modern Western Civilization - and even as I extricate myself from the frequency of exposure to them, I am ever amazed at the widening understanding I am gaining from subjecting them to real, Catholic, restorational scrutiny. Lois Lane: The world doesn't need a Savior, and neither do I. While Superman ultimately contradicts this statement (and wins back her love), you can hear the sneering tone of Screwtape in here. And delivered through the mouth of a (very) pretty heroine. Deviously brilliant. Jor-El (Superman's father): Even though you've been raised as a human, you are not one of them. They can be a great people, Kal-El. They wish to be. They only lack the light to show the way. For this reason above all - their capacity for good - I have sent you, my only son. One might argue here that the wordplay of "El" as a possible diminutive of Elohim, or simply El in Hebrew - which refers to the supreme God - and hence this is simply a mirror - a type for the Father - Son relationship seen in Christ and the Heavenly Father. Yet - can we take seriously as a Savior the man who wanders off to find his home planet right after (albeit unknowingly) fathering a child out of wedlock, and beyond all that, isn't quite certain of his place/purpose in the world? This requires the same stretch of imagination (let's call it "moral flexibility" in the words of the protagonist of Thank You for Smoking) that Muslims and Lutherans have to engage in order to justify following the founders of their religions. If Superman is Christ, there is no way I'm a Christian. Sure, George Reeves and the corny shows of yesteryear which I watched on Nick-at-Nite years ago were great. But the underlying story is fleshed out here. (As an aside, there is an alleged "curse" on those connected to the series - Christopher Reeve's disability and death being more well known, Margot Kidder's mental breakdown being less known) And perhaps George Reeves, in his questionable (perhaps murder) suicide, speaks to us through time - that Superman really isn't the answer. Naive, prudish, puritan? I review. You decide.